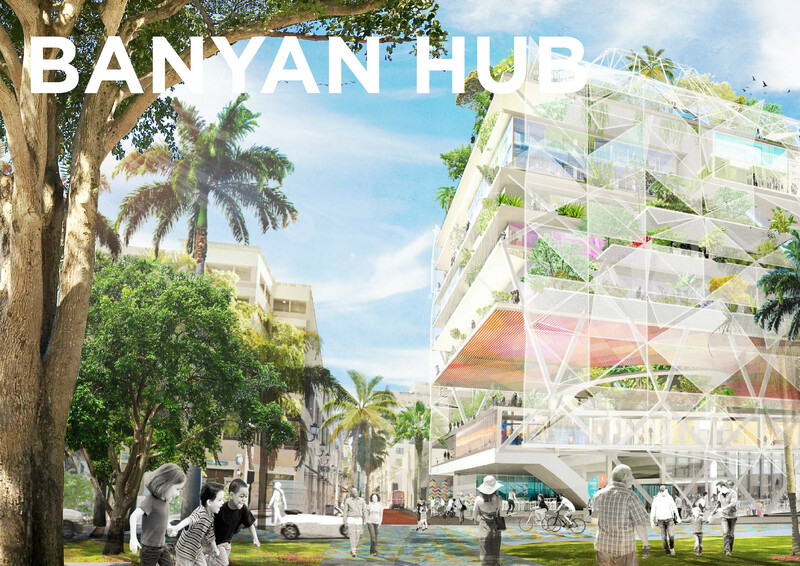 Last July I announced the Shore to Core competition which the City of West Palm Beach commissioned the Van Alen Institute. The results from the top 2 finalists are in and they are pretty amazing. 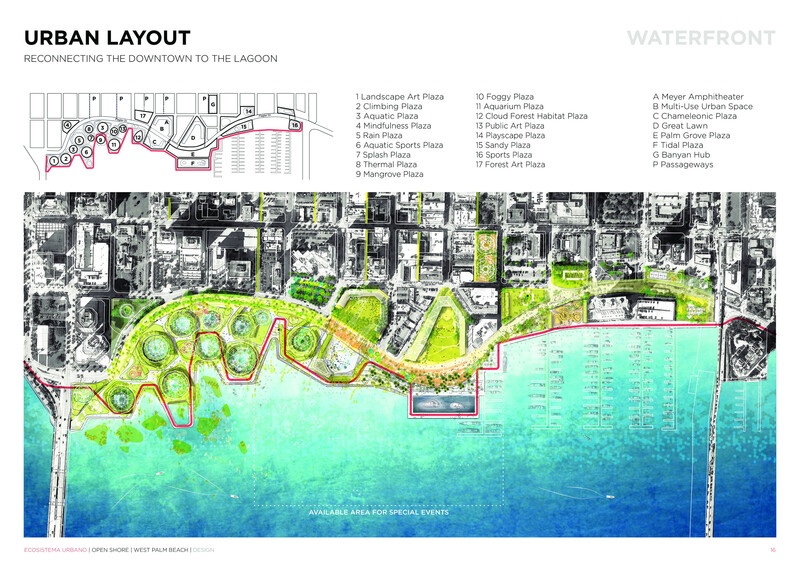 These proposals are first steps in what looks like a pretty massive process and the City wants YOUR INPUT. I’ve taken the time to go through the 57-page proposal from Ecosistema urbano, which is a Madrid based group of architects, urban designers and professionals specialized in urban innovation projects, operating within the principles of design thinking at the intersection between different disciplines: architecture, urban design, engineering, sociology. Sit down, grab a cup of coffee and enjoy! 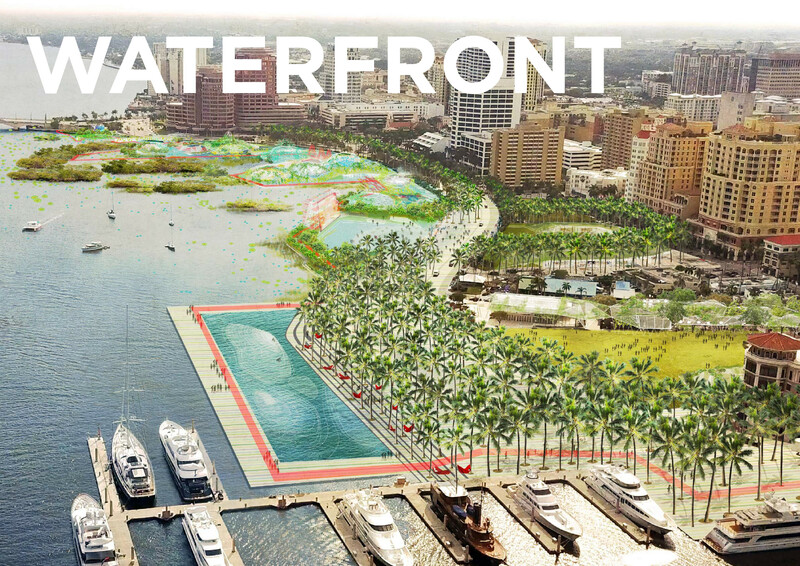 The new waterfront hosts a wide array of outdoor activities and public spaces that enhance the urban experience and multiply the possibilities of interaction with the water. The project takes into consideration the needs of youth and elders alike in order to make a positive impact on the city as a whole and create a healthier living environment for all residents and visitors. 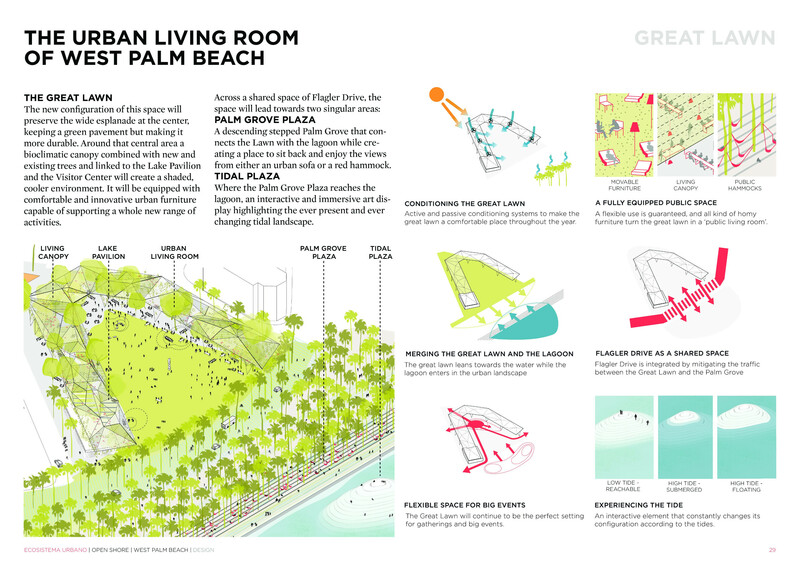 The ecological and resilient design proposed here allows people to enjoy a more comfortable environment all year round: by coordinating natural elements and bioclimatic devices, each space will be characterized by a specific microclimate matched to the activities that will take place there. 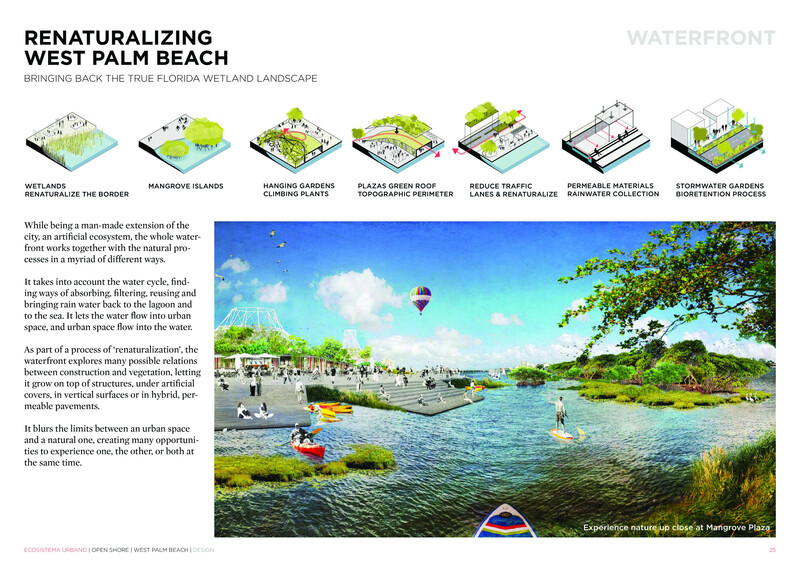 This will also help reconnect people to nature and to the uniqueness of the Lake Worth Lagoon. 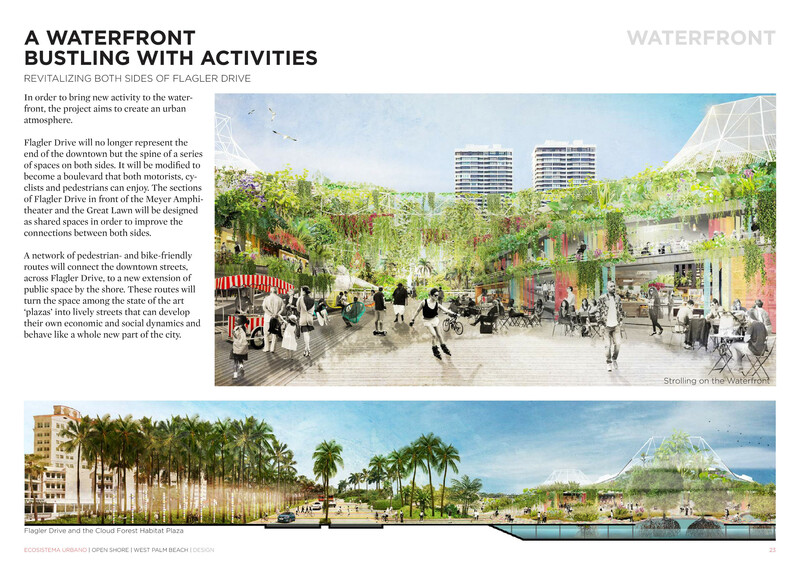 This climatic comfort and range of activities will foster social interaction, making the downtown more active and appealing. The former garage is reimagined as a new focal point for activities in downtown. It will be open to the public day and night, from the ground floor to the public roof terrace. 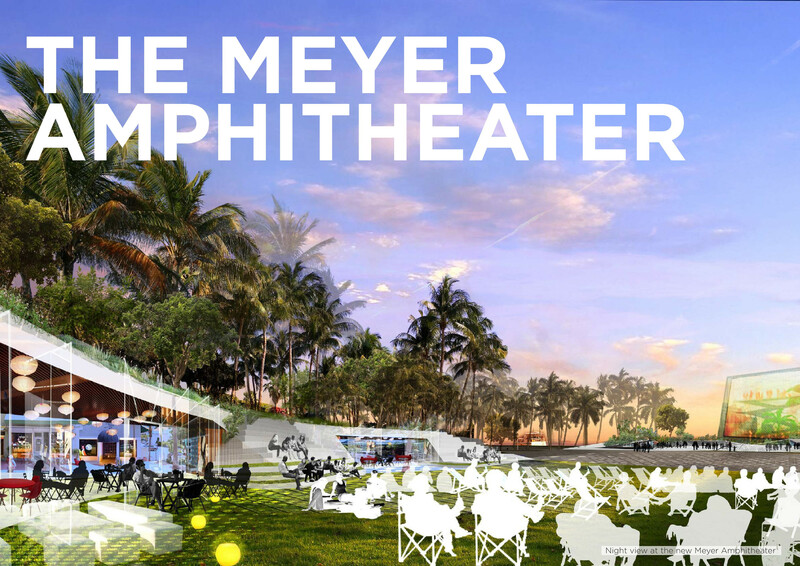 It will have an active presence in the city, attracting business and talent to create knowledge, cultivate culture and foster innovation. Its flexible configuration will allow different uses to coexist and evolve in time, and its design will ensure pleasant environmental conditions all year round while reducing the environmental impact and management costs. 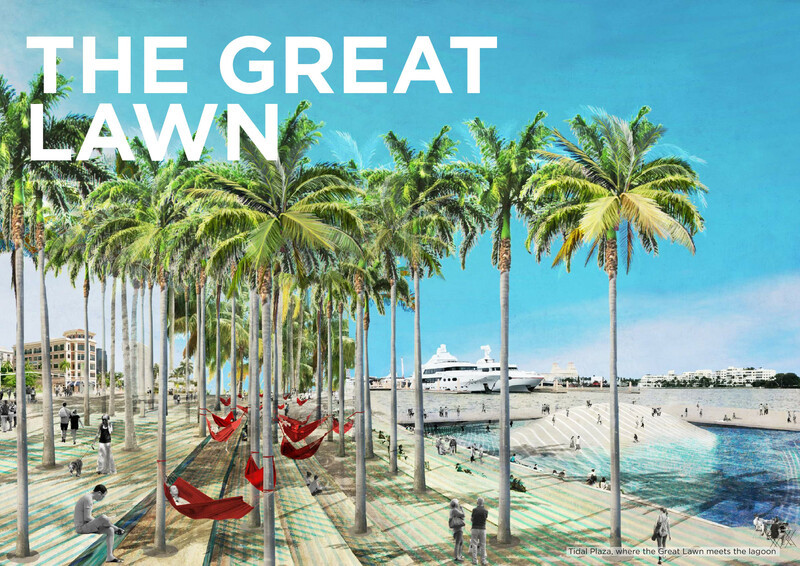 The Great Lawn, already a central part to the city’s life, will become the ‘urban living room’ of West Palm Beach, a place to celebrate big civic events and at the same time enjoy routine activities like resting, meeting, eating or even working in the comfort of a well equipped and conditioned public space. 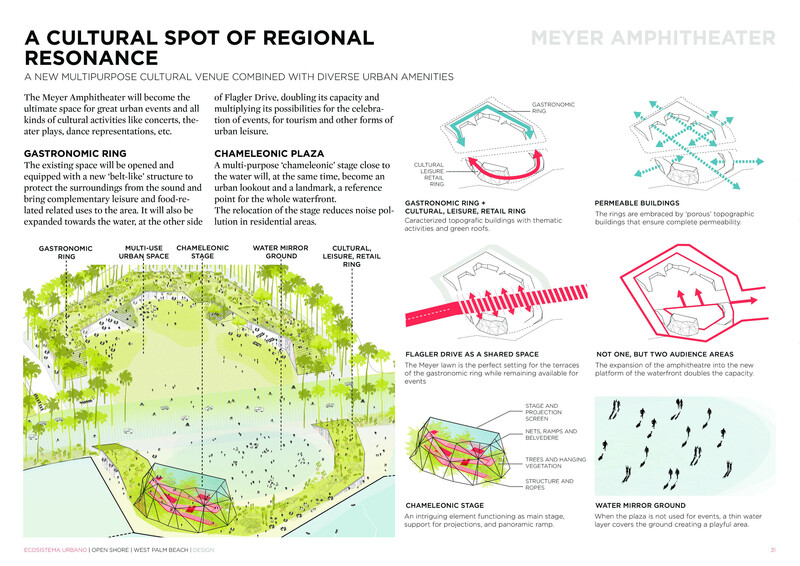 This space will keep a wide, green yet durable esplanade at the center, while adding a shaded and fresh environment around it and two new singular plazas providing an innovative relation between public space and water. 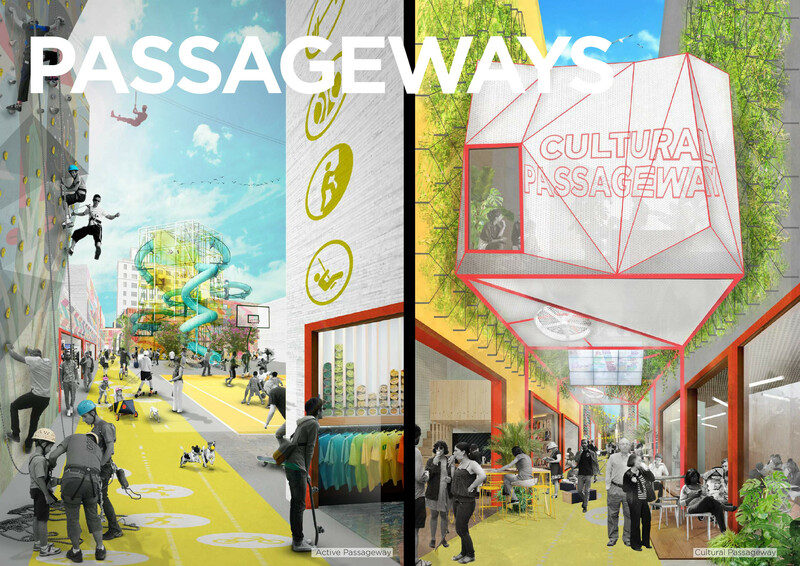 The main goal is to turn the overlooked alleyways into attractive passageways where culture, sport or social activities can take place. 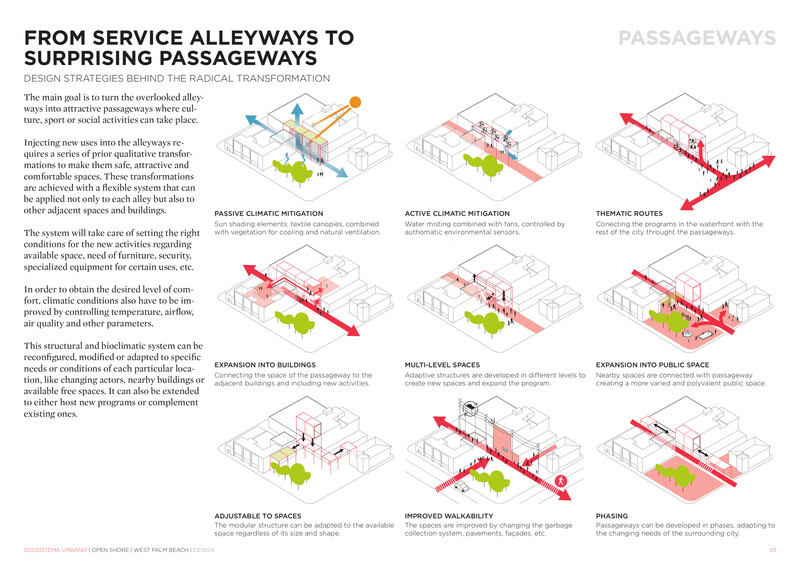 Injecting new uses into the alleyways requires a series of prior qualitative transformations to make them safe, attractive and comfortable spaces. 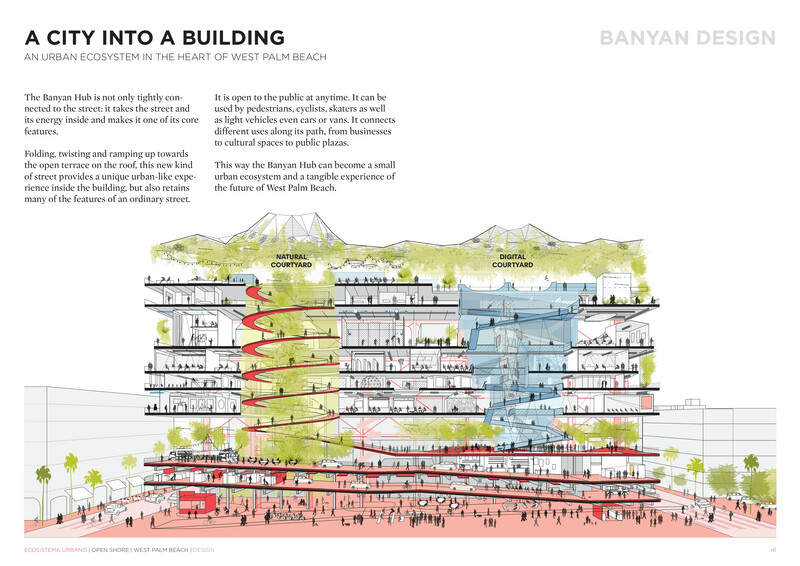 These transformations are achieved with a flexible system that can be applied not only to each alley but also to other adjacent spaces and buildings. The system will take care of setting the right conditions for the new activities regarding available space, need of furniture, security, specialized equipment for certain uses, etc. In order to obtain the desired level of comfort, climatic conditions also have to be improved by controlling temperature, airflow, air quality and other parameters. 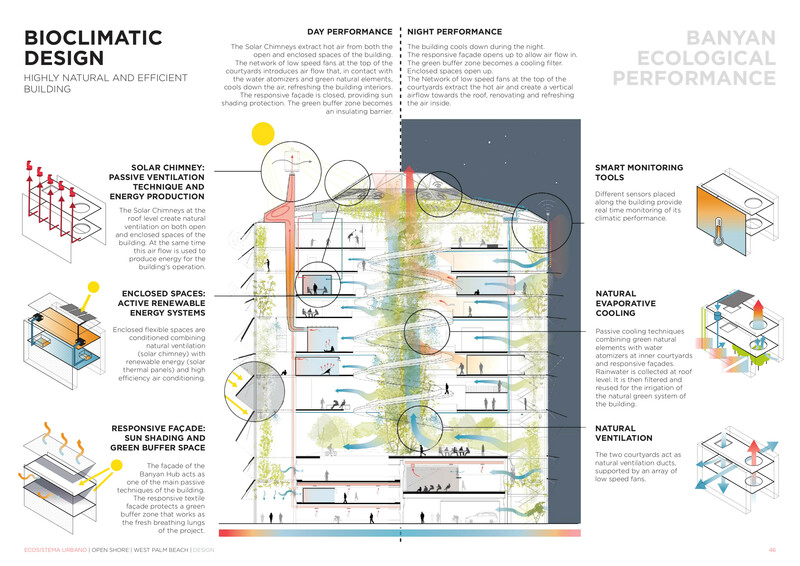 This structural and bioclimatic system can be reconfigured, modified or adapted to specific needs or conditions of each particular location, like changing actors, nearby buildings or available free spaces. It can also be extended to either host new programs or complement existing ones.